Biblical Archaeology Review announced today that the entire March/April edition is available online. Certainly this is to gain subscribers. Nonetheless it is a good opportunity for those who have not read the magazine to take a look. Subjects include an article about a seal bearing the name Jezebel. Does it belong to the wicked Phoenician Queen, wife of Ahab? Another article is about Emmaus, or Emmaus-Nicopolis, where Jesus met with some disciples after his resurrection (Luke 24:13ff.). Here is a photo I made of the fifth century baptistry at Emmaus in 2005. 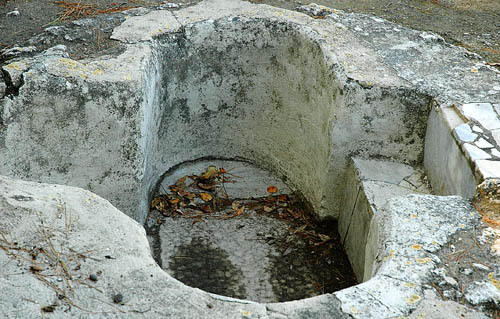 Two steps lead down into the basin where the penitent would stand when the priest poured water over him (the basin is not large enough for total immersion). Of course, I must disagree with BAR. Many a preacher has baptized in a bathtub or some other small vessel when nothing else was available. In New Testament times baptism was immersion, as the word indicates, and as history records. The first known instance of the pouring of water as a substitute for immersion is the case of Novation in A.D. 251. It may well have been that pouring was practiced by the 5th century at Emmaus, but it is a departure from the New Testament (Romans 6:3-4). Baptism is commonly called a washing in the New Testament (Acts 22:16; 1 Corinthians 6:11; Ephesians 5:26; Titus 3:5; Hebrews 10:22). Anyway, go online and read these and other articles from the current issue of BAR. Here is the link. This entry was posted in Archaeology, Bible Places, Bible Study, Israel, New Testament and tagged baptism, BAR, Biblical Archaeology Review, Emmaus. Bookmark the permalink.